Everyone wonders what it's really like in space, but very few of us have ever had the chance to experience it firsthand. 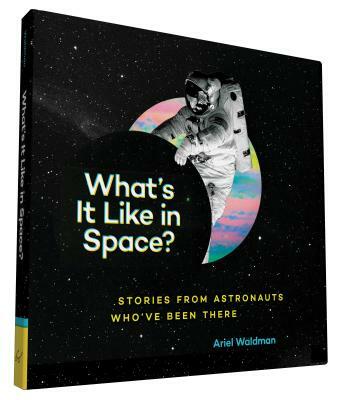 This captivating illustrated collection brings together stories from dozens of international astronauts—men and women who've actually been there—who have returned with accounts of the sometimes weird, often funny, and awe-inspiring sensations and realities of being in space. With playful artwork accompanying each, here are the real stories behind backwards dreams, "moon face," the tricks of sleeping in zero gravity and aiming your sneeze during a spacewalk, the importance of packing hot sauce, and dozens of other cosmic quirks and amazements that come with travel in and beyond low Earth orbit. Ariel Waldman is the global instigator of Science Hack Day, a fellow at the Institute for the Future, a National Academy of Sciences committee member, a White House Champion of Change for Citizen Science, and the founder of Spacehack.org, a directory of ways to participate in space exploration. She lives in San Francisco. "...a delightful mini-coffee table book about all the awkward and beautiful moments you can have in space, based on dozens of interviews with people who have actually been there...If you're looking for a fun read about life outside the gravity well, check out What's It Like In Space?" Holiday Gift Pick "From remembering to pack hot sauce to knowing how to sleep in zero gravity, the book gives readers the chance to know what it's like to live in space for a while." "For most of us, the frame of reference about space we have is limited to movies and TV. But with What's It Like in Space? : Stories from Astronauts Who've Been There, we have an opportunity to gain access to some specific facts about space from dozens of international astronauts. The stories range from hilarious to inspirational and each one comes with a fun illustration as well. Hear from astronauts about quirky things like backwards dreams, the tricks of sleeping in zero gravity, and how in space no one can hear you burp. Great conversation fodder for space junkies that should help satisfy some of our many curiosities." "A-. This charmingly illustrated book is much meatier than its diminutive size would suggest. Through interviews with 10 astronauts, Waldman distills the space experience to its very essence. Every drawing is accompanied by a fact, often explained in an astronaut's words. Did you know that space smells like "fried steak" or that some astronauts can tell what part of the world they're flying over by the light reflected into the cabin? A few of the observations read like poetry: Sally Ride, describing what it's like to watch lightning storms from above, says, 'Sometimes. it looks like a transcontinental brigade is tossing fireworks from cloud to cloud,' and Chris Hadfield remembers a space walk as the 'pouring glory of the world roaring by.' These snippets are so clear, so beautifully curated, that they really do leave you with a sense of what it must be like to float miles above Earth."